Project obstacles and solutions: The city of Princeton, Indiana hired Kris Schafer Construction to reconstruct the sidewalks surrounding the Gibson County courthouse. They wanted a red colored concrete, since the local high school colors are red and white. Kris Schafer turned to IMI to do some test pours of concrete colors with differing decorative applications for the Princeton Mayor and City Council. IMI supplied 420 yards of Rhode Island Red imix Spectra colored concrete. Schafer added a charcoal release to the surface of the concrete to add depth and variety to the color. 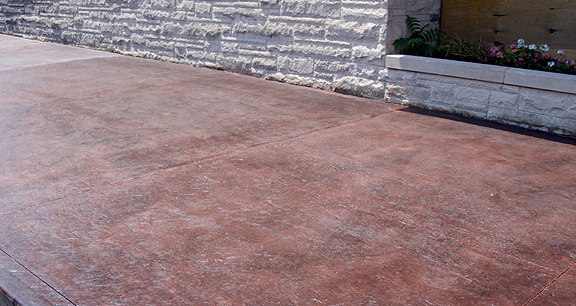 A slate stamp and roller were utilized to put texture into the sidewalks.